GRITTERS have been deployed on Hampshire roads in an unusual measure to protect the county’s highways as temperatures soar. 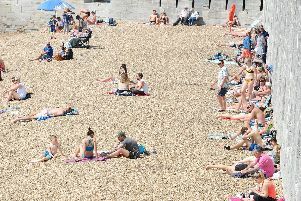 The vehicles are normally deployed during cold snaps to stop road surfaces from freezing, but a number of councils – including Hampshire County Council – are using the vehicles to spread crushed rock dust as the heatwave continues. Some roads have become so hot that they have started to melt and stick to tyres. Crushed rock particles are being spread by councils to create a non-stick layer between roads and vehicles. Local authorities in Cumbria, Lancashire, Doncaster and Hampshire are among those using gritters this week. A spokesman for the Local Government Association said: ‘Snow and ice are the last thing on most people’s minds at the moment and I’m sure there’s been a lot of head-scratching if they’ve seen our gritters out on the roads in the height of summer. ‘However, our gritting teams are once again playing a vital role in keeping the country’s roads safe for motorists. ‘This proactive work helps reduce the potential damage high temperatures can inflict on our roads, so keeping them safe and limiting disruption. RAC spokesman Simon Williams said: ‘Many motorists could be forgiven for thinking the sight of gritters on the road in the summer is a mirage caused by the heat. But they should actually be relieved councils have taken action as road surfaces could easily suffer hard-to-repair long-term damage.